Whether your NAS has 1 or 8 bays, if your goal is to maximize the available storage space, you’ll want to turn your attention to WD’s Red – the only consumer-targeted NAS series that offers a 6TB option. 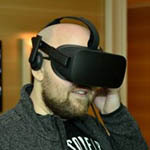 At about $265, it’s not too hard on the wallet, and as we’ll see, it boasts some good performance, as well. Considering the fact that WD announced its Red 6TB hard drive last summer, getting a review of it on the site has taken quite some time. In fact, now that we’ve entered 2015, I took a moment to look back and see when our last look at a bare drive was, and honestly, I was floored. Our last published hard drive review came in late 2013. Coincidentally, it was of WD’s Red 4TB,. I guess there’d be no better drive to follow that up with than the 6TB version, right? So it’s been some time since the last hard drive review (we have had a number of external storage and NAS reviews, however), but there have been a couple of good changes made to our test suite since then. While the test PC itself remains the same, we’ve realized the err of our ways with using a platform equipped with too much RAM. In effect, more RAM = more caching, and that’s not good when the goal is to gauge accurate performance from the drive we’re testing. Going forward, hard drives will be tested in the PC with just 4GB of RAM installed. That’s enough to allow Windows to run with lots of breathing room, but not enough to skew our test results – something helped by the fact that our smallest real-world test transfer is 10GB. None of this means that our older results are inaccurate, per se – it just means we feel more confident with our retested ones. WD’s Red series of hard drives target consumer NAS (network-attached storage) solutions, with disk configurations between 1 and 5 recommended for 4TB and smaller drives, and between 1 and 8 for the 5 and 6TB models. If your intent is to go beyond 8 disks for a single array, WD recommends choosing its Red Pro series instead. Not only is that series faster, it boosts the warranty to 5 years. But, there’s a caveat: there’s no 5 or 6TB model. WD’s current hard drive lineup can be seen below, with some of the more niche series excluded. Normally, “Enterprise” solutions are priced well above consumer solutions, but because few of these series have seen a substantial update in the past year, prices are fairly even across-the-board where 4TB drives are concerned. Both of WD’s 6TB hard drives – Green and Red – are priced at ~$265. While the Red series can work fine in a regular desktop, it’s recommended that the Green series is opted for instead, since it has error correction activated by default, whereas the Red series does not (for the sake of not getting in the way of the NAS RAID controller’s error correction). Usually, the Red series costs a bit more than Green, but we’re just not seeing that right now with the 6TB drives. What about the other densities? And for that matter, how does Seagate factor into all of this? Thankfully, our answers are just a table away. Pricing information courtesy of Amazon and Newegg (01/01/15) . Best (stable) prices selected only. It doesn’t take much effort to see a glaring flaw in Seagate’s line-up: there are no drives larger than 4TB in its regular NAS lineup. At the moment, Seagate’s 6TB drives don’t target regular consumers, something that their “Enterprise” name hints to. Pricing for these drives (either the ‘Capacity’ or ‘NAS’) retail for $400 and upwards. Outside of the 6TB model, WD’s Red series carries a typical premium over the Green, with Seagate matching the Red for the most part. 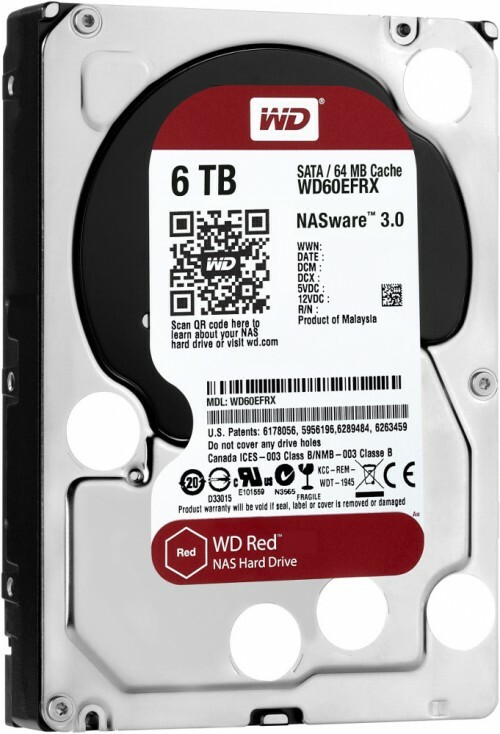 As I mentioned earlier, for arrays consisting of up to 8 disks, the 5 and 6TB Red drives are required thanks to the inclusion of NASWare 3.0, WD’s family of NAS-specific technologies. That’s not to say you wouldn’t be able to run such a large array with the smaller drives; it’s just not officially supported, and possibly for a reason. Reliability: Most desktop drives are not designed for the high operating temperatures or for 24×7 operating environments making them less reliable when used in a NAS system. Enough of ogling the drive and its features – let’s get to testing. The table below lists the hardware used in our current hard drive-testing machine, which remains unchanged throughout all of our testing. Each drive used for the sake of comparison is also listed here. No power-saving options are enabled in the motherboard’s EFI. AHCI is enabled in the motherboard’s EFI for best performance. Only the Intel 6Gbit/s SATA controller is used for test drives. The Windows Search daemon is disabled. Windows Update and OS power-saving settings are disabled. Drives are left unpartitioned (MBR up to 3TB; GPT for 4TB+) when tested with HD Tune and AIDA64, and are formatted with 4KB cluster sizes for PCMark 7 and real-world testing. Futuremark’s PCMark benchmarking suite should need no introduction – it’s been a staple of PC benchmarking for the better part of a decade. PCMark offers a range of tests to gauge every aspect of a computer’s performance and presents it in a simple final result. Thankfully, it also breaks down the overall score with individual subsystem scores (such as Memory, Storage, et cetera) in addition to providing individual test results. As we’re not too concerned with the performance of the PC as a whole, for our testing here we deselect all default tests and run only the “Secondary Storage” suite, with the hard drive in question as the chosen drive. Tests in this suite range from the loading of applications, running a Windows Defender scan, editing video, gaming and more. Overall, WD’s Red 6TB settles in at the middle of the pack, right behind WD’s Se 4TB.. When looking at either the IOPS or the Burst Speed / Access Time, the Red 6TB drive neither impresses nor underwhelms – which is a lot better than what it could be. Let’s see if AIDA backs HD Tune up. Similar to HD Tune, AIDA64’s built-in disk benchmarker is one of the easiest to run. The developer also keeps up on top of architectural trends so that you feel confident that the algorithms don’t get much better than this. This spreads beyond the storage benchmark, as AIDA64’s system stress-testers is one of the best, if not the best, out there. Yet again, the Red 6TB drive only manages to beat out its 4TB brethren, but that shouldn’t strike us as too much of a surprise. Unlike most of the drives in this lineup, the Red series’ platters spin at 5.3K RPM. Seagate’s NAS drive, by comparison, bumps the RPM to 5.9K, which could be the main differentiating factor in the random write test. All of the transfers are conducted with the Windows tool ‘robocopy’, although our MB/s results are calculated manually as the result the tool supplies isn’t accurate. Sometimes, synthetic benchmarks don’t tell the entire story. With our real-world testing, we can see that the Red 6TB outperforms both of the other NAS drives quite handily – topping their performance by around 20MB/s. Even though the Se 4TB outperformed the Red 6TB in earlier tests, the Red reigns supreme here. I’ll preface this conclusion by saying that there are more 6TB hard drive reviews en route. It’d be nice to test out the WD Green, for starters, although I don’t think it’s that necessary. I believe it should perform just about the same as this Red drive, as both have similar designs outside of the error correction. What sets the Red apart is its NAS-specific optimizations. I do have a 6TB NAS drive or two coming from Seagate, but as there have been no announced consumer models, I assume it’s the Enterprise NAS version that’s en route. And since those start at $400, it’s in an entirely different class than WD’s Red 6TB, and would be best comparable to WD’s Red Pro – if that series had a 6TB model, that is. Nonetheless, more reviews are en route, so stay tuned. What can we make of WD’s Red 6TB, then? From both a price and performance standpoint, I’m pleased with what’s on offer here. The drive doesn’t carry a serious premium that’s sometimes expected of the biggest drives – the difference is about $4 per TB over the 4TB model. That’s not the only difference, though: our test results showed that the 6TB consistently performed better than that model. So while you’ll be paying a slight premium (per TB) for the larger drive, you’ll at least be getting better performance out of the deal, as well. This isn’t my last look at WD’s Red 6TB. 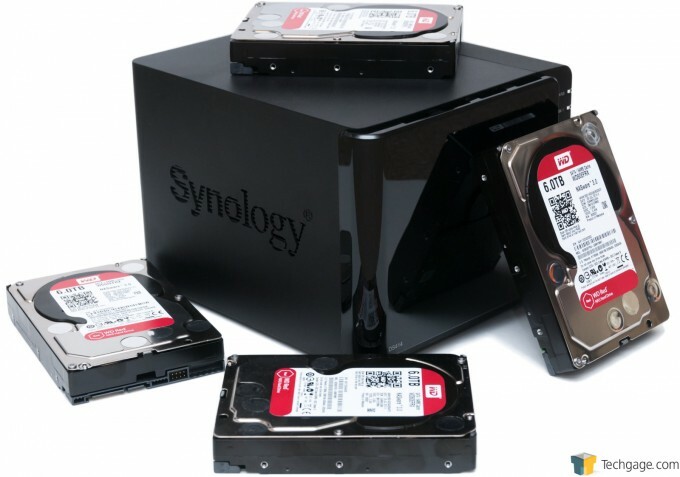 You might have noticed that the Synology DS414 at the top of the page is being attacked by four of these drives, so I’ll be looking at performance from a NAS-specific angle in a different article. Beyond that, I’m also likely to use these drives in a DIY NAS project, which I am quite looking forward to (something else that will result in more reading!). If you’re looking to stock up on big storage for your NAS, you simply can’t go wrong with WD’s Red. At the moment, it’s the only 6TB consumer option, and despite that, it doesn’t carry much of a premium. Overall, it’s a simply fantastic drive. You can purchase these drives from Newegg or Amazon.